After using open source software for a long time, I have finally found a way that I can contribute back to the community. Enter the OpenROV. I've been working on this project with a group of friends and some aspects of the software were bothering me. The software side is hosted on GitHub which makes it easy to contribute to (as well as easy to manage). 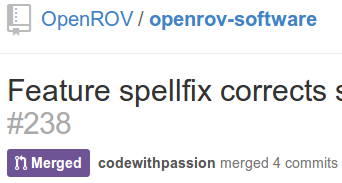 My first (public) pull request is a few small changes related to spelling corrections that were bothering me in the UI. The request was accepted and merged into the OpenROV trunk! That is good news, it means my patches were accepted into the main codebase. I'm tinkering with a Linux kernel module at the moment and if I can find the time I will also try to send up a pull request to raspbian to include it.